Miniature houses make effective conversation pieces for a marketing display, kids’ crafts or a customized centerpiece for a party or event. This is an inexpensive project that offers a chance to reuse cardboard from boxes or packaging. The key to creating realistic miniature houses comes from adding details. Model your miniature cardboard houses on houses you know or from pictures. Use design guidelines and craft supplies to make eye-catching miniature houses on the first try. Spread newspapers on the table and set out the boxes and supplies for the cardboard houses. Select boxes the sizes you want the houses to be. 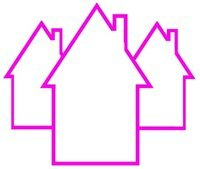 Use one box for each house, or create two-story houses by stacking two same-size boxes. Gift and jewelry boxes work well for smaller miniatures. Shoe boxes and larger boxes work well for kids’ crafts. Use a ruler and a pencil to mark the locations of windows and doors. For example, take the lid off a shoebox and turn the shoebox upside down. Draw a door that starts at the bottom of one narrow end of the box and extends to within two inches of the top of the box. Draw a window on each side of the door. Depending on the size of the box, make the door two to three inches wide and the windows three to four inches wide. Use a scissors or utility knife to cut out the door and windows. Keep your fingers away from the blade. Cut the door on the top and bottom and one side that it will open. Hold the folded paper upright on another piece of card stock at the angle you want the roof on the house and use the edge of it as a pattern to draw two sides of a triangle. Use a ruler to make the third side. Repeat, to create a second triangle. Apply glue 1/2 inch from the edges of the roof on each side and press it against the long edges of the box to attach the roof. Cut out the two triangles. Put glue on all three edges. Insert them at the ends of the roof so they fit on top of the house with the roof resting on their points. Press down gently for a slow count of 30 on each end to help the glue set. Use a small box to make a chimney. Cut one end of the box to match the roof angle. Put glue on the bottom of the chimney and hold it against the roof. Allow the glue to dry for at least an hour. Paint the exterior walls and allow them to dry. Paint the door and the window trim in a different color from the walls, for example a yellow house with white trim. Allow the paint to dry. Paint the roof in a roof color such as gray or rust. Allow it to dry. Use a fine paintbrush to paint lines in the shapes of shingles, if desired. Paint flower boxes and flowers below the windows with a fine tip brush or any other details that fit the house, such as using yellow paint for a brass doorknob.